We are using a manifold system to dispense water to each location. For energy efficiency and water conservation, each line is distributed separately from the incoming water source. Since every pipe is a separate circuit with no breaks or connections, both hot and cold water only go to exactly where they are needed. Again, with having the plumbing all in one central location, the pipes run short distances anyway. 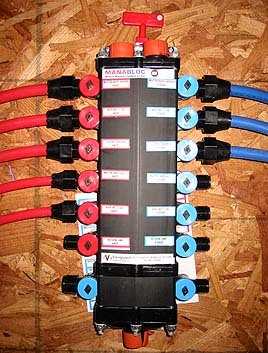 The manifold system also helps eliminate the usual problem of getting scalding water in the shower when someone uses water elsewhere in the house. 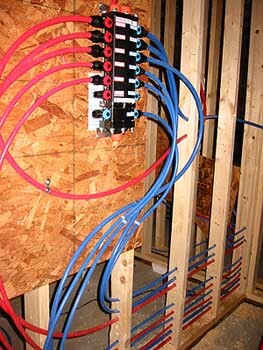 As shown here, the PEX pipes are connected to the Manabloc manifold system in hierarchy order - the top two are the hot and cold water for the master shower, then the guest shower, washing machine and down to the ice maker. If a water leak was to occur, that one line can be shut down without shutting down the entire water supply for the house. Since the toilets will use rainwater from a cistern, they will not be connected here except in extreme cases if we run out of natural rainwater. As an additional water conservation measure, we used 3/8" PEX to the sinks, which will only allow 2.5 gallon flow per minute. A lot of people by-pass the water restriction on faucets defeating the purpose of low flow. 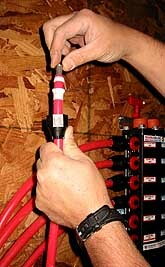 PEX pipe is run just like electrical wire through the walls. 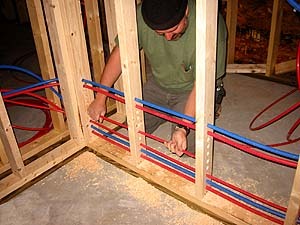 The fittings are added to the PEX pipe to connect to the Manibloc. First the black lock nut (by his left thumb), then the white compression fitting and compression ring, and finally the S.S. anti-collapse insert is placed inside the pipe. Installation- Harrelson's Home Improvement Company.